Variable indicator tubes are vacuum or gas-filled display tubes whose area of luminescence can be varied by adjusting a control voltage or amperage. 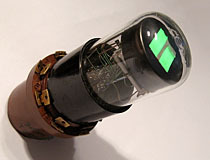 The most common type of variable indicator is the magic eye tube. Magic eyes have a ray-control electrode which dynamically deflects a beam of electrons traveling from the cathode to a fluorescent target. In most tubes the ray-control electrode is connected to the plate of an integrated amplifier triode. Magic eyes were commonly used in consumer tube radios, implemented as a signal strength indicator. The most common tuning eyes are top-viewing with a circular target, though shapes and styles can vary widely. 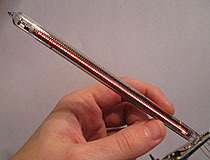 Another type of tuning indicator is the cold-cathode neon bargraph display, or Tunon. Also sometimes known by the trade name Tune A Lite, cold cathode bargraphs display linear values on a metal cathode enclosed in a neon or argon filled envelope. 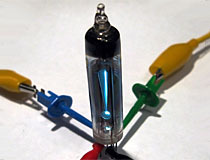 A coating or shaped geometry cause the portion of the cathode with glow discharge to change in size based on the amount of current being applied. The 6E5, which was introduced by RCA in 1935, is a common early model 'tuning eye' display. 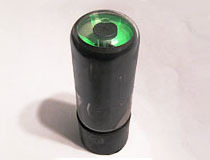 The wedge of darkness on the surface of the 6E5's green phosphor target 'eye' can be opened and closed electronically, allowing the tube to act as a replacement for a much more expensive mechanical meter movement in many devices where precision was not required. 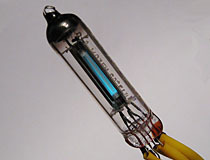 The tube also includes a built in amplifying triode, which reduces the input voltage needed to open and close the shadow on the phosphor target. 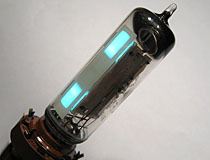 This model of tube was manufactured in great quantity in the 1930s and 1940s, and 6E5 tubes graced the dials of nearly every high-end radio that was sold in the United States during this period. Not all top view magic eye tubes have a circular target. 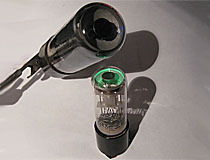 The 6AL7, manufactured by Tung-Sol as well as other companies, is a tuning eye tube with an unusual triple-bar pattern. Each bar in the 6AL7's display pattern is split in half; the bottom of each bar can be controlled separately, while the top section of both bars are ganged together into a single unit. This allows the tube to display up to three linear measurements simultaneously. 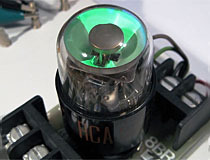 The 6AL7 is a fairly common part, but its lack of an internal triode complicates the process of adapting this tube model to replace rarer tuning eyes. Builders must typically add an external triode or semiconductor stand-in to adapt this display into devices not designed to use it. The 1D-E14 is a small low voltage tuning eye tube intended for use in portable battery powered radios. Manufactured by Toyo Musen, the 1D-E14 has a narrow band of phosphor which varies in width based on a control signal. 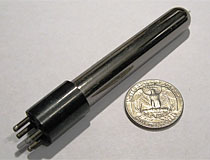 This tube is quite small for a tuning eye tube, and has an envelope length of approximately 42mm. Voltage requirements are also very low, as would befit a battery radio tube... in the thumbnail photo, the target voltage is 9 volts and the filament voltage is 1.4 volts. At a mere 25mm in length, the 6977 is considered by most tube collectors to be the world's smallest eye tube, although referring to this device as an eye tube is not strictly accurate. Though the 6977 has a control grid, the indicator region does not vary in size relative to the control grid input signal. Instead, the control grid simply varies the brightness of the glow. 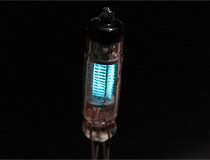 That being said, the 6977 is a unique device, a subminiature triode with a phosphor coating that visually indicates the tube's internal state. The 6977 was originally designed as a logic indicator for early computer systems, but saw nearly as much use as a triode for battery powered radios and similar devices. The 6AF6 is a traditional circular 'cats eye' style tuning indicator in a small, stubby octal-base envelope. This truncated envelope size is possible due to the fact that the 6AF6 lacks an internal triode, and as such will not work with many tuning eye circuits unless an external triode is added. Each of the two 'vanes' on the 6AF6's display can be opened and closed individually. The EM87 is a linear "magic eye" style tuning indicator. Unlike more traditional magic eye tubes, which have a circular phosphor coated metal target, the EM87 has a strip of phosphorescent material applied directly to the side of the envelope. The shadow on this tube expands symmetrically outward from the center of the tube's phosphor strip, and will reach all the way to the top and bottom of the strip when fully extended. 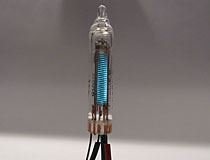 The tube has a 6 volt filament and a standard 9 pin base. The DM70 is a small low power tuning eye tube intended for use in battery powered radios. DM70 tubes have a plate voltage of only 45 volts, a tiny amount compared to larger eye tubes like the 6E5, which requires a plate voltage in excess of 200 volts. The tube also requires a very low 1.4 volt filament voltage, and can be easily destroyed from excess voltage. The DM70 has a rather unusual display pattern, the tube's side viewed phosphor target is masked by an exclamation point-shaped stencil. In operation, the 'bar' portion of the exclamation point will shrink to the top of the tube and the 'dot' portion will grow dimmer at the grid voltage is varied. The CV359 is a bargraph indicator tube, designed for use as a power indicator in microwave applications. The CV359 consists of a glass bulb and a long, thin neck which is filled with neon and encased in a protective metal shield. In operation, the tube's neck is inserted through the side of a waveguide in such a manner as to allow the microwave beam to strike the small bit of exposed glass on the end. This excites the neon gas inside the tube and causes it to glow. 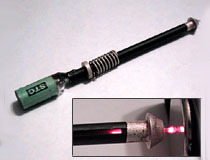 A small slot in the tube's metal shield allows the operator to view the length of the glow discharge. The IV-15 is the Soviet analog of the popular 6977 / DM160 miniature tuning indicator tube. Like the 6977, the IV-15 does not have a variable length display; only the brightness can be changed. These tubes will illuminate nicely at 9VDC; filament voltage is 1.2VDC. Although the 25mm envelope height of the IV-15 is identical to that of the the 6977, the IV-15 has a substantially larger diameter. Nonetheless, it is still a very tiny device.